Diamond dust started falling around Himos, Finland on 14 December, and kept on for 4 consecutive days. This display with subparhelia was shot on the first day. A full parhelic circle was also observed, and for a short time, part of the subparhelic circle was visible, too ( 1 ). Marko Riikonen sampled the crystals during the display ( 2 ). The other subparhelia seems inclined more than the other. The display forms practically in very little space around the camera lens, I think tens of centimeters to meters, depending on the distance between camera and lamp. Could it be that air flow near the camera is changed for example by the observer body and this affects the crystal orientations and produces this asymmetry? Agnes has also from Kilpisjärvi similar interesting image. And, the subparhelic circle photo is pleasing to the eye. Ágnes seems to have the talent for taking halo photos that are more than just documentary. Marko remembers well. Some of the Kilpisjärvi images from 2008 show similar asymmetry. Like this one, for example. I too have noticed this. Here it is not so marked though. The Kilpisjärvi photo was taken very close to the lamp where the space in which display forms around the camera lens is very small and air flow anomalies caused by physical objects become evident easily. Interesting indeed. 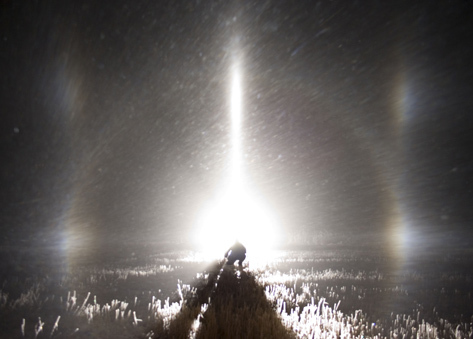 Those cases that you present really show anomalous inclination of the parhelion/subparhelion, and that must, well, let's say may..., be due to unusual crystal orientation. I think that you are on the right track, Marko. Agnes really! The subph circle -photo is great! I have completely lost the ability to take Photographs (notice the capital P) - if I ever posessed such skill in the first place - and have plummeted to an ugly documentation level. Good to see that someone is still interested in esthetics and has an eye for it. Umm, where's the subparhelic circle? 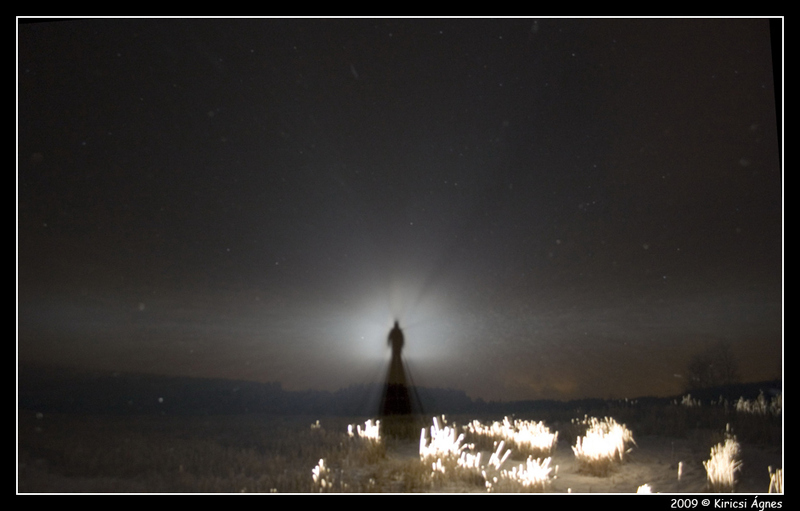 I see only the parhelic circle (at the camera height) in the image..
Panu, the lamp is at a negative elevation. Wow!!! Cool subparhelia you got there!! Hery wheres superparhelia at and wheres the sub-kern and sub-cza? Theres been no halos for me in Ohio USA its cloudy, wet, and muddy not good weather for halos. Please, folks, let's call the upper halos in the photo superparhelia and superlamp rather than subparhelia and subsun. (I am not so concerned here with the 'sun' versus 'lamp.' It is the 'sub' versus 'super' that worries me.) So, if you take my suggestion, the superparhelia (and superlamp) are always at least as high as both the observer and the lamp, regardless of whether the lamp is above or below the horizon. And the subparhelia are always at least as low as both the observer and the lamp. Yes, the superparhelia (and subparhelia) change their appearance dramatically according to whether the lamp is above or below the horizon; that's O.K. But they do not change their ray paths: For example, the ray path for the left subparhelion is 325, whether or not the lamp is above or below the horizon---again, this is if you follow my scheme. That is, the ray path does not change to 315 when the lamp is below, as your current usage requires. I do understand the intuition behind your naming scheme, but I think it is not so good in the long run. Thanks for listening. I think the negative and positive lamp stuff should still be separated somehow, for the interest of the hunt. As you say, they look different. Positive lamp stuff is non-eye-connected and has no resemblance with sun/moon halos while the negative lamp stuff is eye-conneted and looks similar to the sun/moon halos. Grouping them into same without making any differentiation does not feel right. Anyway, if we follow the super-scheme we have to think about the whole scheme. Shall we then also have, on the superparhelic circle, a superanthelion and superanthelic arcs crossing it? And more, if we have supersun, then we have superhelic arc? I am also wondering what should be upper sunvex Parry be called when lamp goes below horizon. Does it become lower sunvex Parry? Or are they actually the same phenomenon, there are only three Lowitz arc components but four Parry arcs? Are there actually only three Parry arcs? I think Jarmo suggested once calling these halos "inverted subhalos", or something like that. I am not yet convinced of Walt's suggestion although I see (or at least think so) his point. Walt and others: I am presently preparing a paper for the next AO Special Issue and am faced with in the same sub/super terminology problems as you do. In my case, it has to do with a subsun above the sun (so for negative solar elevation). I sympathize with the thought to invent another term for such a phenomena, but I am not too exited about ‘supersun’, as the word ‘super’ has the second meaning of ‘very strong/bright’. Independently of Jarmo I used for a while ‘inverted subsun’ in my draft, but that seems too cumbersome (like ‘negative debt’). In my opinion, the use of the prefix ‘supra’ instead of removes that problem as it is more neutral than the prefix ‘super’. So my proposal is to name an ‘inverted subsun’ (that is: a subsun for negative solar elevation) a suprasun; a subparhelion for negative solar elevation a ‘supraparhelion’, etc.